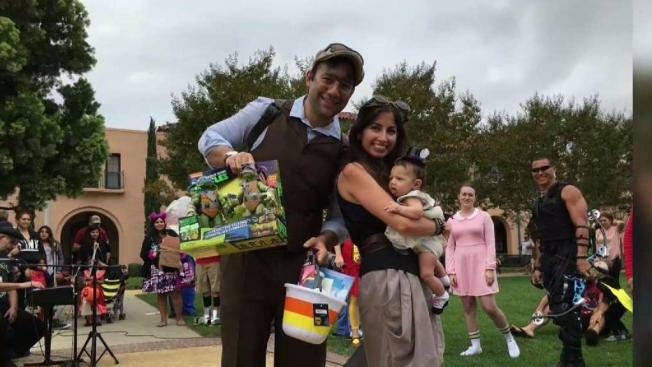 Round up the kids and put on those cute costumes: it's time for Halloween season in San Diego. There are lots of family-friendly ways to celebrate the spooky holiday. Here's a guide of some things to do with your little ghouls this month. Scientists from Scripps Institution of Oceanography lead kids on a journey that explores the world of unusual underwater creatures and spooky species rarely seen at Birch Aquarium, including skeleton shrimp and sea spiders. Mini scientists can expect to see a sea of glowing creatures – big and small – and enjoy scary stories, dance to live music and partake in creepy crafts, including making their own "seaweed slime." Costumes are encouraged. Tickets cost $20 at the door (or $18.50 in advance); the event is free for kids 2 and under. Downtown El Cajon will host this free family-friendly celebration, which includes all things Halloween: a pumpkin patch, costume contest and activities where you can win Halloween candy. Also on deck: carnival rides, a kids zone, a car show and two stages of live music. Looking for some early Halloween fun for the whole family? Now in its fifth year, this family-friendly harvest festival transforms Mission Beach's iconic seaside attraction, Belmont Park, into a fall wonderland every Friday, Saturday and Sunday in October, beginning at 5 p.m. The park offers free trick-or-treating for kids 12 and younger (6:30 p.m. to 7:30 p.m.), zombie laser tag ($8 per person), a pumpkin patch, costume contests, crafts (pumpkin sand art, cookie decorating and more) and favorite fall snacks like pumpkin spice funnel cake and caramel apples. Take the kids over to the San Elijo Lagoon Nature Center to enjoy some animal meet-and-greets at the center's 6th annual Not-So-Scary Estuary Family Discovery Day. Kids in costume can join in on a parade and compete for prizes. This year's theme is "Changing Climate," with performances about sea level rise and a "zero-waste" activity. Park at Mira Costa College (333 Manchester Ave.); a free shuttle service will transport attendees to and from the Nature Center throughout the event. Happening every weekend through the end of October, SeaWorld’s Halloween Spooktacular invites kids to visit in their Halloween costumes for a trick-or-treating adventure at special stops around the park. The event includes impromptu dance parties with costumed characters and Halloween-themed shows like "Clyde & Seamore’s Big Halloween Bash at the Sea Lion and Otter Stadium and Sesame Street’s “Who Said Boo?” at the Mission Bay Theater. Another area of the park celebrates Dia De Los Muertos with lots of colorful décor and activities dedicated to the traditional Mexican holiday which comes just after Halloween. Entry into Spooktacular events is included with paid admission into the park. The Pacific Southwest Railway Museum Association is hosting its 12th annual Pumpkin Express Halloween Celebration, a chance to ride decorated, vintage railcars through the San Diego County mountains in Campo. The train departs from the Campo Depot at 10 a.m., 12:15 p.m. and 2:30 p.m. on Saturdays and Sundays this month, and winds through scenic parts of the historic San Diego and Arizona Railway. Tickets range between $5 and $18, depending on your age and child tickets include a pumpkin. Reservations must be made in advance, as there are 210 seats available on each ride. At the Campo Depot’s display building, visitors can explore two haunted trains, a pumpkin patch and meet some ghouls and ghosts. Brick-or-Treat Party Nights return to LEGOLAND each Saturday this month, during extended park hours, from 5 p.m. to 9 p.m. The Halloween-themed event includes live entertainment, new shows, costume contests, treat stations, a pumpkin patch, crafts and dance parties. Admission to Brick-or-Treat only is $59, or you can pay $79 to visit the park all day and stay for the extended Brick-or-Treat hours. Little Italy businesses will open their doors to little monsters in costume for a fun night of safe trick-or-treating in the cool urban neighborhood. Piazza Basilone (on the corner of India and W. Fir streets) will have a list of businesses participating in the event, plus trick-or-treating maps. Billed as San Diego’s only Halloween parade, the 13th annual Boulevard Boo Parade returns to El Cajon Boulevard with ghoulish floats, vintage cars, costumes, bands and spooky surprises. The free parade starts at the intersection of El Cajon and Rolando boulevards then travels west to 60th Street. Visitors can view the procession from the south side of El Cajon Boulevard. After the parade, the College Avenue Baptist Church (4747 College Ave.) will host the free AfterBOO! Carnival from 11 a.m. to 2 p.m., featuring rides, games, inflatable play structures, arts and crafts vendors, food vendors and live music. This 9th annual free event at Balboa Park invites families to celebrate Halloween in a safe and fun way as more than two dozen museums offer free admission to kids 12 and under, with a paying adult. Throughout the day, participating museums will host free craft projects for kids, costume parades and contests, gallery tours and other spooky surprises, such as a 2:30 p.m. rooftop pumpkin drop at the San Diego Air & Space Museum. Kids 12 and under who wear their costumes to Family Day can ride the famous Balboa Park Carousel for free. Food trucks and free activity booths will line the Prado and Plaza de Panama. There will also be costume contests and even a "Thriller" flash mob. Is San Diego's iconic Star of India haunted? Hop aboard the famous ship for a night of spooky stories. Every 15 minutes, from 6 p.m. to 9:15 p.m. on Oct. 21 and Oct. 28, kids can enjoy lantern-led tours of the Star of India and hear eerie tales, including how the spirit of a young man named John Campbell may lurk on board. 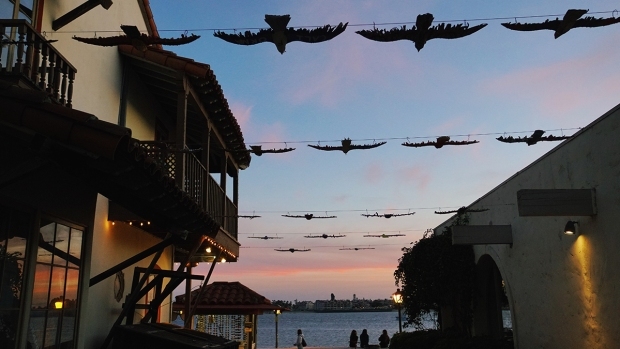 The Haunted Tales event is included with paid admission to the Maritime Museum San Diego. This 3rd annual Halloween bash invites families to the Arts District at Liberty Station for a day of costumes, trick-or-treating, music and more.